Review: Follows two assassins who carry out a sinister mission. The plot revolves around a fatally ill teacher, an enigmatic janitor and a curious waitress leading a dangerous double life. Murderous consequences unravel into the dead of night as their lives meet at the hands of a criminal mastermind wanting revenge. I found this film to be all over the place. I couldn’t work out what was going on at all and was thoroughly confused. 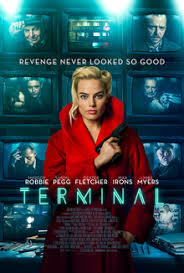 I don’t understand that these two actors, Margot Robbie and Simon Pegg agreed to be in a film as bad as this. Simon Pegg looked completely out of place. It was like everyone was trying to be too clever and wanted it to be more than what it was. Trying to be too much like Blade Runner (1982). Whoever wrote the script should be ashamed of themselves as it was terrible. Only one cinema in the entire of the UK (The Prince Charles Cinema in London) showed the film during the opening week following release. I was bored watching this utter trash. One of the worst films of 2018! !